Hello and welcome to Week #44 of the DMX Frid’Eh Update presented by Addikt Graphic. This week, we find ourselves back in action with the continuation of the Rockstar Triple Crown Supercross Series. It’s been a long break in the action and it seems to be taking us all a little time to get our mojo back. We’ll get it. We’re currently on our way to Quebec City from London. We stopped over at some relatives in Ottawa for the night and stayed up pretty late playing pool and listening to music. The final leg of our trip is about 4 1/2 hours of driving that will keep us up on the north side of the river and into QC. It will be a nice change from the 401 grind. Anyway, week #44 goes out to the South Carolina racer who we met in 2017 as he did the entire Canadian series. Jonathan Mayzak is the stylish rider who always caught your eye out there on the track with his smoothness. I always found my camera going toward him during the races because it was hard to take a bad shot of him! Seriously, they’re all bangers. Anyway, he was back in Canada in this past summer and we got in touch with him to get to know him better. Here’s what he had to say. Direct Motocross: Hello, Jonathan. OK, let’s start at the beginning. Where are you from? How old are you? And how did you get into Motocross in the first place? Jonathan Mayzak: Hey, how’s it going? I’m from Murrells Inlet, South Carolina. I’m 19 years old. And my mom got me on a bike when I was 4 and we started going to the local races and taking it a little more serious when I was 5. My first number was number 424 because of my birthday being April 24th. My first race was at Bremen MX in Georgia and I’m pretty sure I hit the gate and beat maybe 1 or 2 kids on a full gate. Wasn’t the prettiest, to say the least, but I had a blast (Laughs). I think the highlight of my amateur career would be going to Loretta’s in the Open Pro Sport class in 2015 or getting all top 10 finishes in the 250 and 450 B Stock and Mod classes at Ponca City in 2013. How did your Intermediate/B year go, and who were the top guys you were up against? My B Class year went all right for me. I had a couple good finishes here and there but I was hurt for most of it, unfortunately. At the time, I think Jordon Smith was the top guy to beat in the B class. I got my AMA Pro license in 2015 and tried some of the nationals in 2016 but didn’t qualify for the main in any. Then, shortly after is when I came up to Canada for the 2017 season and ran the whole series and felt pretty good all year in the MX1 class. What was the highlight of your 2017 summer that earned you #44? Definitely, my 12th overall at Deschambault, for sure. I went 11-15 in the sloppy mud with crashing both motos but had a blast. I’ve always loved racing in the mud so when the sky opened up there I knew it was gonna be a good day. Prior to this year, I probably would’ve said Deschambault but after racing the nationals this year and getting to race at Minnedosa, I think McNabb Valley is the new favorite. Your best moto of last summer came in the first moto of the first round — a 14th. Can you take us through that one? Was it your best ride of the summer? Yeah, Calgary was fun and I felt great all day. The first moto there was a crazy pile-up in the first turn which I managed to get out of clean and put myself in a good finishing position. But I definitely wouldn’t consider Calgary my best ride of the year. I had a good finish but I felt like my true speed was definitely shown at different races, compared to Calgary. At Sand Del Lee is when I felt like my speed was really there, but had horrible starts and was charging through the back of the pack both motos. You ended up 24th in Motocross with your best finish a 16th overall at round 5 in Ottawa at Sand Del Lee. Can you sum up the summer for us? Are you happy with your results? Yeah, my season didn’t go exactly the way I wanted. I felt great and was picking up my speed every race until I got to Gopher Dunes where I got a great start then fell in the second turn. After that 3 laps in I hit a kicker on a little double in the back and sent me over the bars. I tried getting back up to finish the moto but it just wasn’t working for me. I ended up compressing a couple vertebrae and a slight wrist injury in the process, so, unfortunately, that ended the rest of the season for me. I went looking for some photos of you for this column and every one was a banger! You’ve got great style. Is that something you think about or work on, or is it just natural? Thanks, I appreciate it! Growing up, I’ve always tried to have a sick, flowy style and throw clean whips and scrubs, but when I was about 14 is really when I started cranking it and feeling comfortable. But yeah, I’d definitely say I work on my style still. Probably just as much as going fast, honestly (Laughs). Now we’re into the Supercross series here in Canada but we haven’t seen you racing. Where have you been? Yeah, unfortunately, I haven’t been able to make any of the Supercross races this year. I planned on racing them but after my crash at Gopher I decided to skip it and give myself time to be ready for the 2019 nationals. How do you think the first season under new ownership/management went? I think the new management season went well. Even though I didn’t get to race it, it was super-cool they brought Walton back. I was real bummed about missing that one. But overall I think it was pretty organized and they did a good job. What are your winter racing plans? I’ll probably just take it easy and do some local payout races near me and maybe travel if there’s good payouts somewhere, but nothing big planned in the works yet. What are your racing plans for next summer? Next summer I plan to race all of the east coast AMA outdoor nationals on a 250 and try to hit as many Canadian nationals as I can on the 450. What is it you do for your 9-5 job? What do you see yourself doing in the future? I jump around a bunch of jobs while I’m not racing. I do some MX training schools at County Line MX in Bolton, NC, sell cars for my dad, part-time restaurant job, and currently opening some businesses with my parents. I definitely like to keep busy while I’m not racing, but in the future after racing I’d probably like to just run the local family businesses and hopefully own a track somewhere. OK, thank you and good luck. Who would you like to thank? Absolutely, and thank you, I appreciate it! I’d like to thank my mom and dad, my brothers, Jacob and Matthew, who are in the marines and overseas, FXR racing, Integrity Automotive Promotions, Leatt, Good Time Connoisseurs, Sandbox Kings, Mobius Braces, and Todd Lachance from TLR Performance. Week #44 is presented by Addikt Graphic. Check them out online to get ready for 2019. Based out of Quebec, Addikt Graphic prides ourselves on our work, specializing in dirt bike appearance and other moto related sticky media. From complete custom moto graphics kits to jersey lettering, your passion is what drives us time again to produce top quality graphics kits, exactly how you imagined it. Hey, guys. Happy Friday. The 2nd-to-last round of our inaugural Triple Crown Series is this weekend in Quebec City. The series has been good, very good. The talent has been stacked, the tracks have been very good, and the fans have been rewarded with some fantastic racing. In the 250 class, it has been “The Jess Pettis Show.” Jess has been on another level all season long, inside and out. He has been dominant at times, but also very consistent. His fitness and confidence is on an all-time high, and it is showing on the track. The only guy that looks to be in the same area code indoors so far is Logan Karnow. Logan is an indoors type of guy, not saying he’s soft or anything like that, but he just prefers the indoor racing, and it suits him well. If anyone can steal a win from Jess, Logan just may be the guy. Not far off, we have the always-dangerous Shawn Maffenbeier. Shawn has the speed and talent to run with anyone, but I don’t see him hanging it all out this late. He’s a really smart guy, and he knows his limits, and I respect that. I think the two 250 guys to watch will be the rookie duo of Tanner Ward and Marco Cannella. These two guys have been putting in a ton of hours getting this ‘SX thing’ down, and I think 1 of them, if not both of them, have a legit chance of being on the podium. In the 450 class, like all indoor season, all eyes are on Cole Thompson and Colton Facciotti. These two have been going at it tooth and nail all season long. They are the only two in line for the $100g’s, and you can count on some great racing between these two. One guy that should be showing these two a wheel everywhere is Matt Goerke. Goerke has some serious indoor skills and really should be fighting for wins. He’s a hard worker and he has a great team behind him. I’d look for Matt to go out with a bang these last two race weekends, and I really think he’s going to be looking to play spoiler with Colt and Cole. We can’t forget the newest addition to the OTSFF Rockstar Yamaha squad. ‘Filthy’ Phil Nicoletti has now had some time to get used to the new bike, and he should be thinking nothing less than podiums. Phil has a ton of indoor experience and smarts, and he too could steal a win on the right night. All in all, the racing will be exciting in both classes. Let’s hope the racing stays clean, and the fight for the 100 thousand dollars goes right down to the final lap in Hamilton in a few weeks. With Halloween behind us, that means Christmas isn’t far away now. If there are any racers/riders looking for a great gift idea, I have a 2016 Scott Foil 30 Large (56) for sale. This beautiful bike is a demo and in need of a home. If you are interested, please email me at jeff@directmotocross.com. 2016 Scott Foil for sale. Before I go, I’d like to wish a very big Happy Birthday to J-Ro, Jacqueline Ross. She is one of the baddest to ever throw a leg over a bike. Let’s hope she misses us up here sooner than later and we see the #734 north of the border. Have a great weekend and we will see you next week. #smileforBC! Thanks, Jeff. 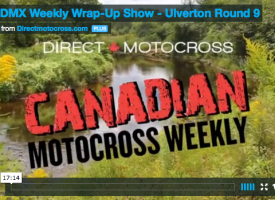 Yep, we’re finally back in action this week for the Quebec City Supercross. We’re at a brand new arena that houses an Olympic-sized hockey rink. It should have strong wifi which means we should be able to go Facebook Live throughout the day and night. We’ll test it out Saturday morning and let you know. With a lot of empty gates, the past couple rounds have let us down a little bit on the amateur racing side. However, this week we will see full gates in every class. They’ve been full for a few weeks now, so that is a great sign. You can always count on Quebec to provide enthusiastic support of moto. I’m really looking forward to watching the Open Intermediate races again. It should be another good battle between #53 Bjorn Viney and #20 Jeremy McKie. On the Pro side, we’re going to see someone new make an appearance up at the front this week. Team PRMX Strikt Kawasaki has hired the services of journeyman racer, Daniel Herrlein. Daniel has been a round for a while now and has always been a guy with huge talent, but just needs a solid break to prove what he can do. I think this may be his chance. I’ve seen him race all over the place, and he’s really good at the tight, indoor stuff, so these last two rounds are going to be right in his wheelhouse. He’ll be alongside another rider who will be in the mix with the top guys. Cody VanBuskirk is that name you always see when you scroll through the Monster Energy AMA Supercross results. You don’t know anything about him, but his name is always there. Jeff already went through the battles a the very top of the Pro classes, so I just wanted to point out a couple riders he didn’t mention that should be up there and in the mix. Canadian Shelby Turner will have her hands full this weekend as she tries to defend her Endurocross title at the final round in Idaho. She’s currently ties in points with Kacy Martinez from California. With Shelby coming off her injury, she’s fighting to get herself back in peak race shape. Good luck to the Barons, Alberta, racer this week. Well, we pulled over at a bunch of different places north of the St. Lawrence River here in Quebec and I’m unable to join any of their wifi networks, apparently. Feeling pretty frustrated, this will be the end of this Frid’Eh Update. Be sure to follow us on Twitter, Instagram, and Facebook Saturday for all the action from the Videotron Centre in Quebec City. They’ll be up and live on the Rockstar Triple Crown site, so be sure to watch the Supercross action live. We’ve still got 2 hours driving to go, so have a great weekend, everyone.